#AmmanCitadel by Jeres H Al Namat. The meeting across the ocean by Tamara Alwash. Clouds of Harmony by Abdulrahman Alazawi. AKCHOUR in Tangier , Morocco . In this world we keep searching for happiness in the outside. Never thought happiness within me and in the moment! Experiences change your view on things...literally. Budapest, Hungary. A well needed rest after finishing the wonderful Copolia trail. Seychelles is a heaven on earth, a perfect destination for a family holiday, I've been there once and definetly be there again. A golden sunset from the lowest point on earth. The dead sea is one of my best destinations i've ever had in Jordan, it has a great salt formations, and great compositions, a place that you can find your soul within peace. Friendture - a central hub for finding genuine local experiences - is looking for a photograph or a snap that shows a pleasant experience, solo or with a group, while traveling locally or around the world. Friendture in collaboration with Working Dreamers have started this competition to remind people to invest time for fun stuff like: traveling, exploring, discovering, and experiencing something new. So If you have what it takes and think that your talent can inspire people to invest the time in fun, then go ahead and share your best photo today and win with us. 1 or 2 winners will be selected to win prizes brought to you by Working Dreamers, Friendture, Dead Sea Spa and Canon. Each participant can submit one photograph each. 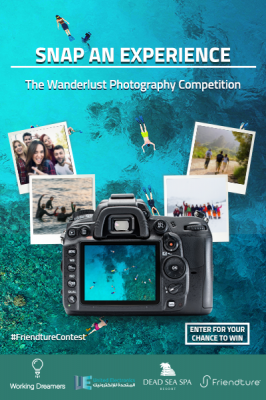 By submitting an entry, participants give the organisers the right to use their entries to promote the competition and usage of the photos in their mobile app and website. (i.e. the catalogue, publicity in the press and on other media, posters, etc. ).